Manor Parish has made a wonderful response to Catherine Fish's appeal for Christmas shoe boxes for the Day Centre in Moldova for children with special needs. 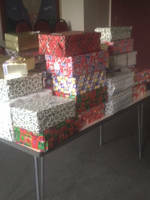 The generosity of people at St Aidan’s and St Swithuns has come up with 44 wrapped filled shoeboxes. Catherine would like to say a big thank you to all who helped in this way.